As in English, a "tip" is an advice or a piece of useful information. The verb "tippen" is "to give someone a tip". Its passive form – to receive information – is "getipt worden". Don't confuse "tippen" with "tippelen" which is what prostitutes do. – "De politieman werd getipt over de drugsdeal." – "Ik heb hem getipt over die vacature, omdat ik vond dat hij geknipt was voor die baan." – "Zij tipten hun vrienden over het huis, zodat zij een bod konden doen voordat het op de markt kwam." – "De criminelen werden getipt dat de politie een inval zou doen." – "Ik zit middenin een moeilijke onderhandeling; kun jij me niet nog wat goede tips geven?" – "Tips en trucjes": tips and tricks. – "Getipt worden als": to be seen as the successor of someone in an important position. – "Zij wordt getipt als de volgende president van Egypte." – Advies: advice [noun] [het advies, de adviezen]. – Adviseren: to advise [verb] [adviseerde, heeft geadviseerd]. "Tippen" can also mean "to give a tip". To complicate things, the Dutch word for the tip is totally unrelated to the verb: "fooi". "Een fooi geven" (to give a tip) is synonymous to "tippen". – "De meeste Nederlanders tippen behoorlijk weinig." – "Amerikanen tippen tot wel 20%; Nederlanders geven een fooi van maximaal 10%." – "Vind je dat de service goed moet zijn of tip je altijd in de horeca?" – Fooi: tip [noun] [de fooi, de fooien]. – "Hoeveel fooi hebben we gekregen vanavond?" A third meaning of "tippen" is used when comparing achievements of persons. The expression used is "aan iemand tippen" (to equal someone or someone's performance) and it is usually used in the negative sense. – "Hoewel hij het zijn hele leven geprobeerd heeft, kon hij nooit aan de successen van zijn tweelingbroer tippen." – "De wedstrijdzwemmer kon niet tippen aan zijn concurrent die het wereldrecord op zijn naam heeft staan." – "Denk jij dat je kunt tippen aan je baas?" 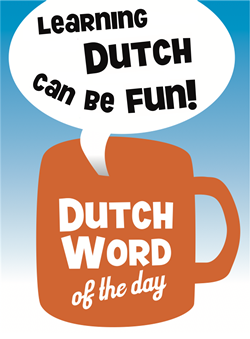 This entry was posted in Dutch word of the day, DWOTD 1.0, Vocabulary Intermediate and tagged advies, adviseren, fooi, tip, tippen by Dutch Gurus. Bookmark the permalink. Mrs.Chris – whose perfect English is far, far better than mine I may say – has an unfortunate confusion that is similar to this. When she means “pimple” she uses the word “pimp” instead. I can only imagine what is going through bystanders’ heads when they overhear “I think I have a pimp on my neck” as she said the other day. “Tippen” in the meaning of “een fooi geven” is a new development in the Dutch language, probably due the influence of American TV-shows. I only heard it from people below the age of 25. I wouldn’t use tippen as a verb at all. Just a tip. And definitely not as “een fooi geven” … Apparently the dictionary includes that meaning now, but I don’t really agree with it.